This weekend I had the pleasure of visiting not one, but two baseball stadiums on the west coast of Florida. In a way it was bittersweet, as one met with a wrecking ball in 2007, leaving behind many spring training and minor league memories, but the upside was I saw a fantastic game at Bright House Field in Clearwater and for the third time this season while covering minor league and spring training games, a new attendance record was set! On Friday, July 3rd, had the chance to see the Clearwater Threshers, the Phillies Class A affiliate in the Florida State League, take on the evil empire Yankees from Tampa. I had been to Bright House Field for a spring training game this spring, and looked forward to the trip back. What a wonderful stadium. I can see why it’s consistently ranked as one of the best places to watch a baseball game. For this evening’s contest, we actually sat out on the berm which runs the entire length of the outfield fence. Lots of friendly fans and families enjoying a wonderful night at the ballpark. I gotta say the grub was pretty good too! Arriving early and walking around, we stopped by one of the Threshers tables, and I signed up to participate in an on field game. Never had a chance to do that before! Corey and Craig escorted us to field level at the end of the 4th inning, and got to see under the stadium which included the Threshers batting cage. I won’t say whether I won the contest or not, but it was a blast being out in front of the crowd hamming it up! 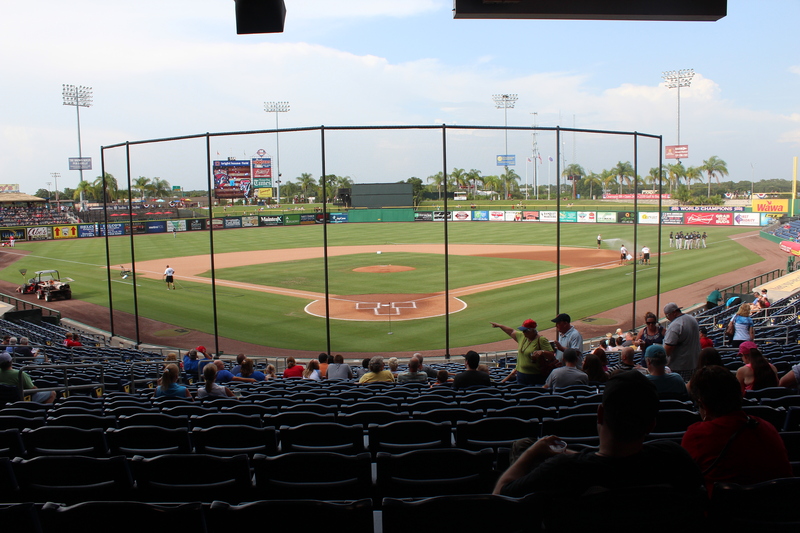 Bright House Field has a listed capacity of 8,500, and the Threshers single game attendance record was 9,090 against the Lakeland Flying Tigers set on (coincidentally) another July 3rd game, in 2008. On this night, however, a new attendance record was set, with 9,966 fans in attendance. That makes the third game I’ve been to this year with a new attendance record: a spring training game in Bradenton at McKechnie Field, and a Toledo Mud Hens game at Fifth Third Stadium. The Threshers even wore some very cool Independence Day unis. In the end, the home town fans went home happy with a 3-0 win over Tampa! I am SOO looking forward to my next trip to Clearwater to see the Threshers in action! 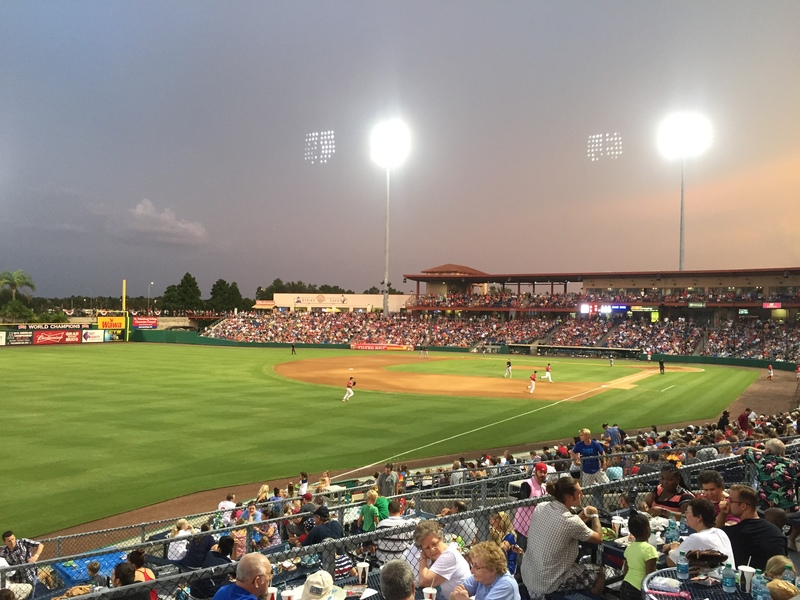 Bright House Field opened in 2004, and is the Phillies’ third Clearwater spring-training home. The team moved to Clearwater in 1947. 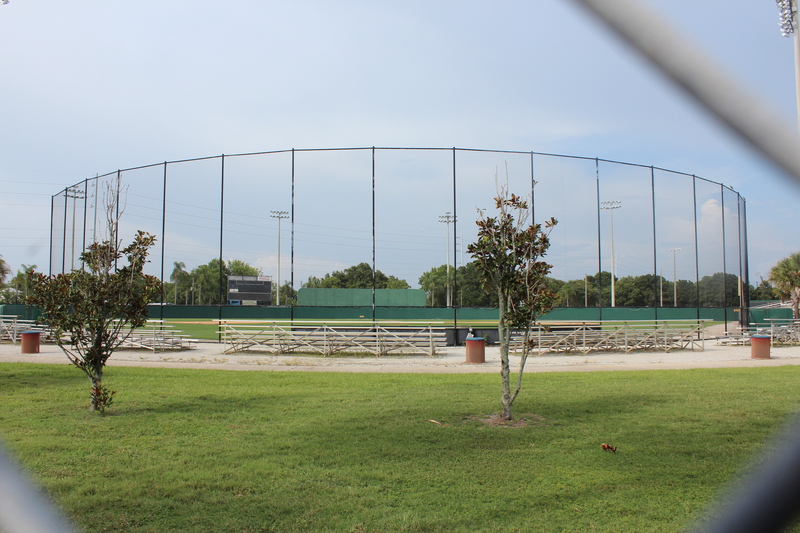 They trained and played home games at Clearwater Athletic Field from 1947 to 1954. The City of Clearwater opened a new ballpark for spring training in 1955 and named it Jack Russell Stadium. 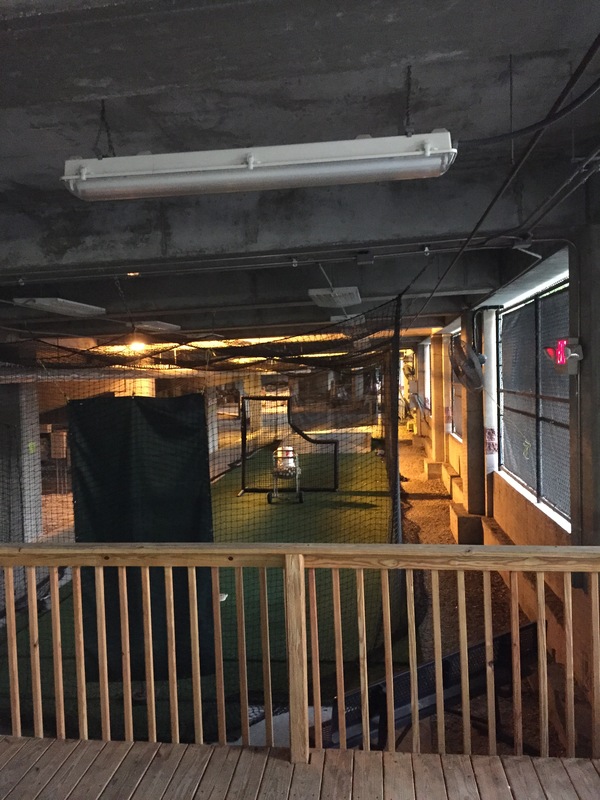 With the stadium aging, the Phillies and the city erected their new spring home adjacent to the Phillies’ year-round training facility, the Carpenter Complex, four-miles east of Jack Russell Memorial Stadium. Jack Russell Stadium Jack Russell Memorial Stadium, located in Clearwater, FL, opened in 1955, and is named after former MLBer Jack Russell. It was the spring home of the Phillies, and had an original capacity of approximately 4700 (later expanded to 6900). It was also home to the Clearwater Bombers, a perennial powerhouse in amateur softball, winning 10 national titles from 1950-1973, In 1985, the Clearwater Phillies joined the Class A Florida State Leauge. The FSL traces its roots back to 1919, with original teams like the Bartow Polkers, Bradenton Growers, Lakeland Highlanders, and Orlando Tigers. In 1985, Wilbur Snapp became the first organist to be tossed by an umpire during a game. Snapp, who had been playing spring training and minor league games since 1982, played “Three Blind Mice” after a close play where a Clearwater Phillie was called out. Snapp got the heave ho by the ump, and received a standing ovation. Jack Russell Stadium was partially razed in 2007, but is still used for high school and other amateur games, and as a training facility. While it might not have had the grandeur and history that other classic stadiums had, it’s always a sad thing to visit a stadium and only see remnants of baseball history. Great photos from Clearwater. The Florida State League is definitely a trip I need to take to see. Clearwater looks like a great stadium and I love the logo.